A few weeks ago I received an e-mail about the World’s Largest Coffee Break to be held May 10 at 3 p.m. Eastern time. Hoping to break the record of 3,000 people taking a break at the same time, the Fair Trade Organization wants to educate people about fair prices, fair labor conditions and direct trade agreements. This brought back memories of a CFCA Mission Awareness Trip to Guatemala that I took this past December with my daughter, Dawn, who works for CFCA in the Kansas City office. During the trip, we met our sponsored children and their families. 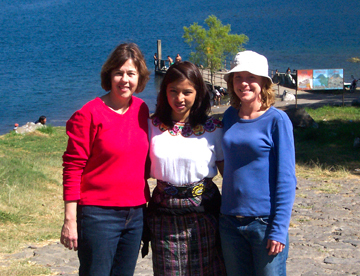 It was a wonderful experience and it truly gave me an appreciation of the simple beauty and the richness of the Guatemalan culture. While visiting the San Lucas Mission on the third day of our trip, we listened to Father Greg Schaffer talk about the Juan Ana Coffee Project. He told us how Juan Ana coffee, though not part of the famed “Fair Trade” program, is very similar in the respect that it provides a fair price for the farmers of San Lucas Toliman area. The producers in San Lucas actually determine the price they will need for producing and selling the very best coffee they produce. He explained that every aspect of their coffee production: from picking the coffee fruit, drying, sorting, roasting and finally packaging the coffee is done by small independent farmers. These families take great pride in what they produce and are directly involved in deciding how the extra funds they receive will be used to benefit their community. That day we saw how CFCA partners with the San Lucas Mission to empower people to use their God-given talents to provide a decent standard of living for their families. We left the mission that day with 10 bags of coffee, envisioning how we would invite our parish back home to build a real and lasting relationship with these coffee producers of Guatemala. Now, on the second Sunday of each month, we sell Juan Ana coffee and “Fair Trade” decaffeinated coffee, tea and chocolate to our parishioners. Our parish takes pride in the fact that we are making choices that respect human dignity and promote economic justice while building a true sense of global solidarity. I see a great connection between CFCA and Fair Trade. Both organizations are about living out the Gospel call to serve the poor. Both focus on building relationships and recognizing the God-given dignity of each person and their gifts. Both CFCA and Fair Trade provide hope for those who are trapped in poverty. So on the weekend of May 10, you may want to consider being a part of the World’s Largest Coffee Break by drinking Fair Trade coffee. You can purchase Juan Ana coffee, the best coffee available from Guatemala, through the San Lucas Mission office in New Ulm, Minn. Or you may want to celebrate Mother’s Day by giving a gift of tea, chocolate or flowers (available through “A Greater Gift” Fair Trade). Thank you, CFCA and Fair Trade, for helping me learn to build relationships.